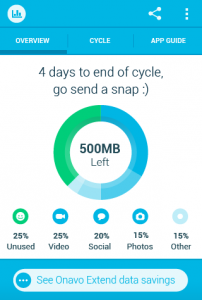 Onavo Count is a powerful data monitoring app that watches data usage in the background. It’s available for free for Android and iOS users, and support hundreds of operators around the world (such as Verizon, T-Mobile, AT&T, Sprint, Vodafone, Orange, or Movistar, among many others). These days, if you have a smartphone without an unlimited data plan, you probably have seen some surprises in more than one bill. Many apps consume more data that we thought, and most carriers don’t have any kind of data cap once our monthly data plan is over. Here is where this app comes really handy. Once you have installed Onavo Count, you just need to set up your data cap, the billing day of the month and it does the rest. 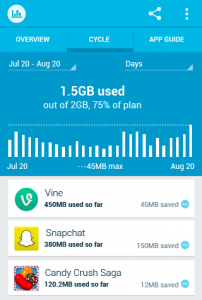 The app monitors and analyses all data use, including background, foreground and Wi-Fi. You can check at anytime the list of active apps running on your device, with the data use of each one. 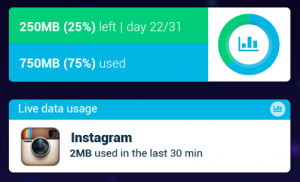 Onavo can alert you if some app is consuming a lot of data in the background and it can also restrict the data usage depending on your billing cycle. You can install several widgets in the desktop with the most useful information. Onavo Count uses all this information to analyze your data plans and consumes. It can suggest you how to reduce the amount of data use and which plan available will better fit your needs. The information of all Onavo’s users is analyzed, and every time you download a new app, Onavo can alert you if it had been a data hog to other users. The company has a complementary app, Onavo Extend, with can optimize and reduce your data use. It says that your data usage can be increased up to five times (the amount is not the same for everybody, as it depends on the apps you are using). Both apps are free and can be downloaded from the App Store (Onavo Count and Onavo Extend) and Google Play (Onavo Count and Onavo Extend).